RB-DD4 4 Channel Digital Audio Delay, (Shown With Video Sync). Using a front panel button, you can select which channel needs to be delayed. There is also an ‘ALL’ option which allows the selected delay to be applied to all channels. Then using another front panel button you can select the length of one frame of delay and the multiple of frames to delay by. The connectivity is incredibly flexible, allowing three different types of connection to each input and output including AES/EBU, S/PDIF and TOSLink. All three different types of output can be used simultaneously. There is a monitor socket on the front panel which allows you to listen to each mono channel, by front panel selection. Pairs of channels can be monitored (1 & 2 or 3 & 4) using a rear panel stereo option. There is also an option to attenuate the monitor by 12dB selectable by rear panel DIPswitch. Audio presence is detected and displayed for each channel around the INPUTS 1 & 2 and INPUTS 3 & 4 buttons. In this mode the digital output sample rate is simply set by, and locked to, the internal on-board clock generator. No sync signal is used or required. 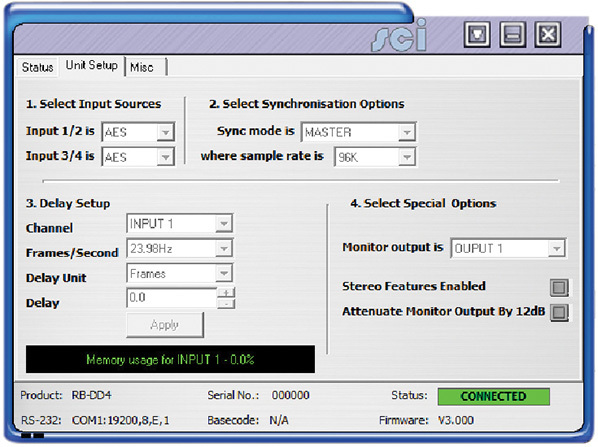 In this mode the digital output sample rate follows the selected sync input. 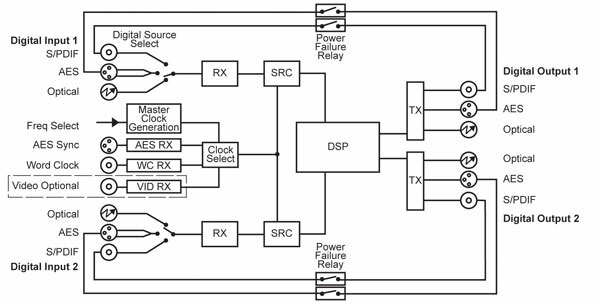 When the sync signal is not present the output sample rate will be set by, and locked to, the internal on-board clock generator at the selected output frequency. 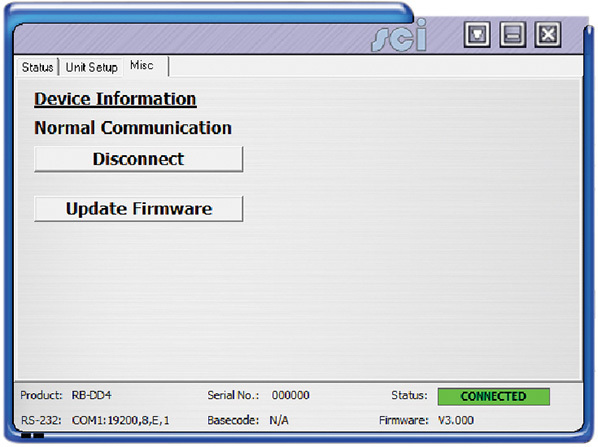 In this mode no output will be generated until lock is achieved with a sync signal. The digital output sample rate now follows the sync input. 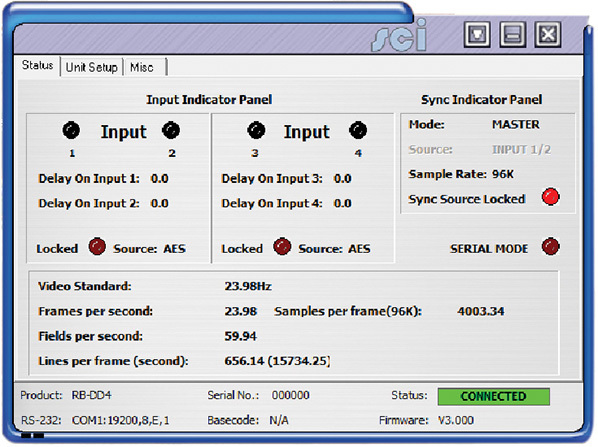 If the sync signal is removed then the output sample rate will be set by, and locked to, the internal on-board clock generator at the closest frequency available to the previous sync input. In this mode the digital output sample rate follows the sync input. When the sync signal is not present the digital output is turned off. A powerful feature of the RB-DD4 is that by using the Sonifex SCi serial software, the unit can be programmed for different delay durations, levels and switching functions so that you can program the unit for your specific application. A rear panel DIPswitch configures the unit to be controlled serially. Contact Sonifex for further information if you have a particular requirement that isn’t catered for by the RB-DD4 as standard. The RB-DD4 has been designed to have a passive signal path through the main input, so if power to the unit fails, signal inputs 1 & 2 are routed to outputs 1 & 2 and signal inputs 3 & 4 are routed to outputs 3 & 4. This is essential for applications such as installation at transmitter sites, where a power failure to the unit should not prevent the audio input signal from being output to the transmitter. Please note that this is not true for the TOSLink outputs which are muted. * Note that this product is deeper than standard Redboxes.